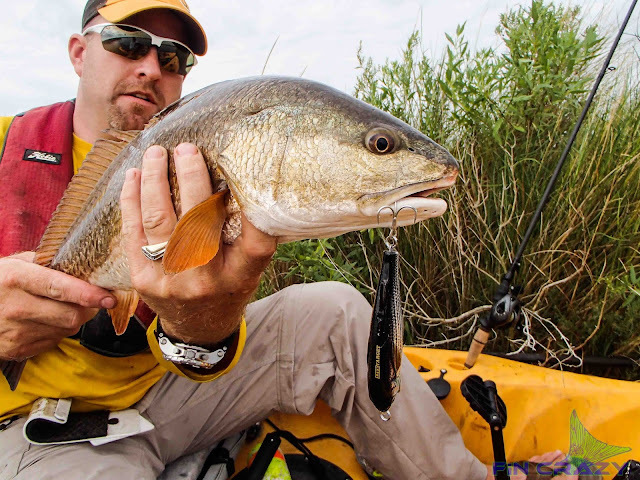 This year’s Minimalist Challenge, put on by Bayou Coast Kayak Fishing Club, turned out to be one for the record books. 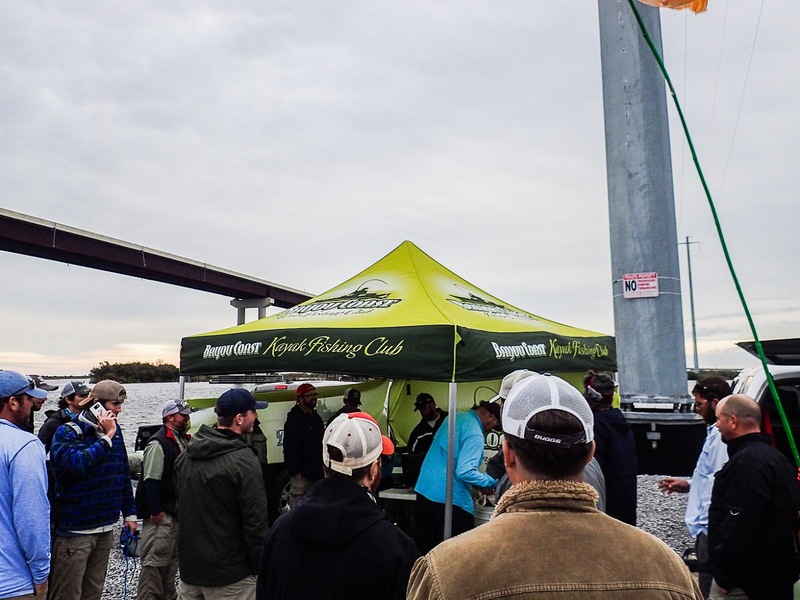 With a record amount of anglers, a record amount of weight at the scales, and a record sell out time, anglers from all over Louisiana showed up at the public launch in Leeville to take part in what some call, the best little tournament of the year. 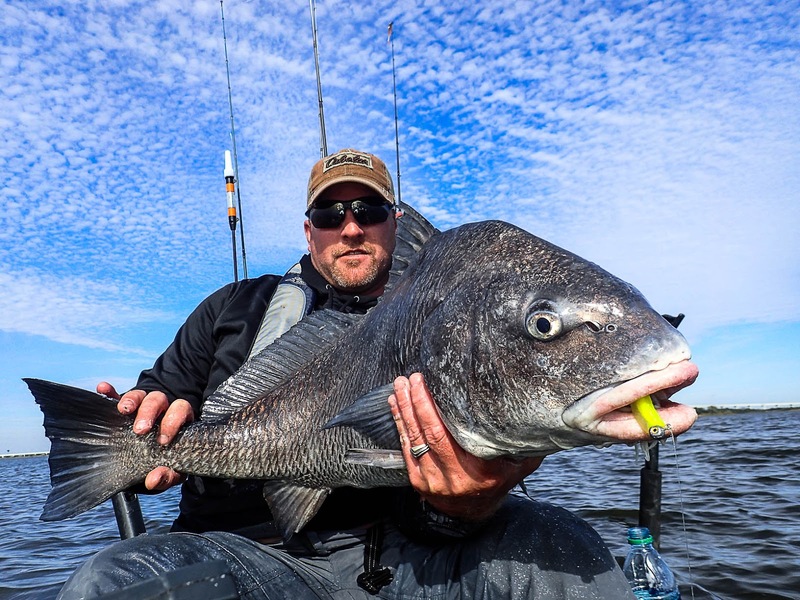 The Minimalist Challenge is exactly what its name portrays; anglers show up with nothing but their rods, reels, and kayaks and then are given the lures they are allowed to use. 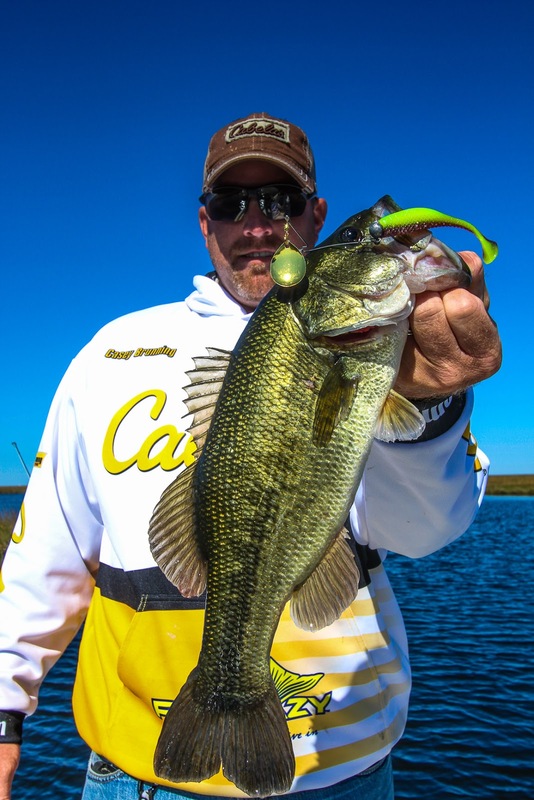 This year anglers received a topwater, by MirrOlure, and 5 soft plastics and jig heads by Matrix Shad, which according to every angler I spoke with, is the best combination of lures the tournament has ever had. 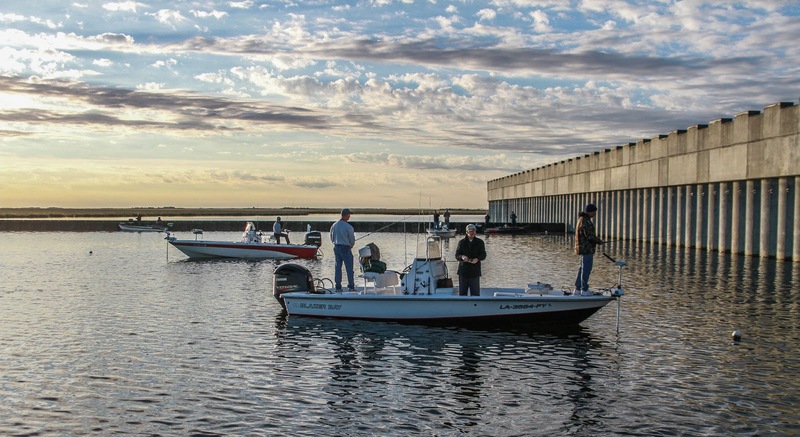 As 125 anglers sat floating in the holding area awaiting the blast off horn, the breeze slowed, hats came off, and the voices silenced as Bill Crawford began to speak. Bill, also known as Revredfish, said a prayer to guide us all in our endeavors, to bless the fleet, and most all to recognize the passing of Capt. Kristen Wray. 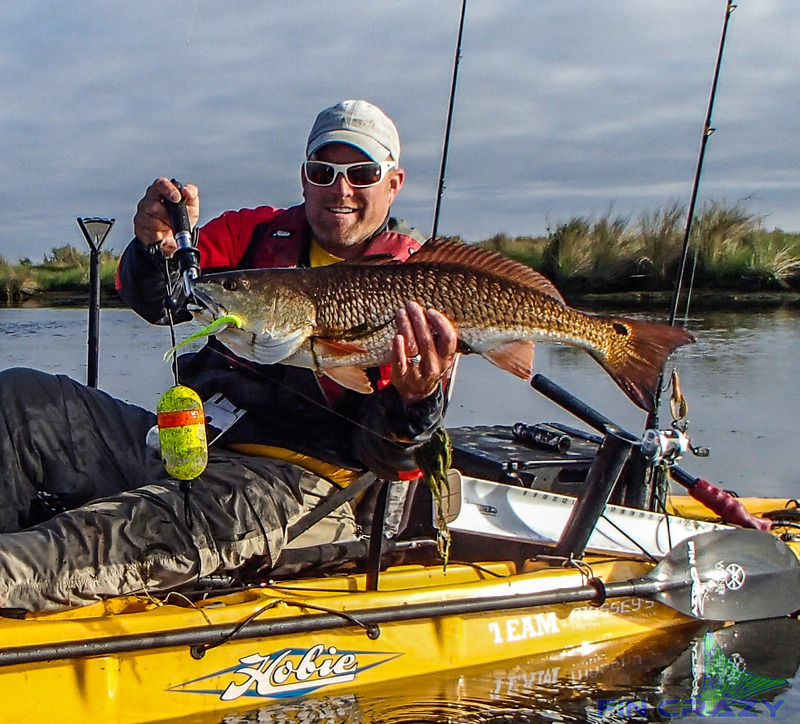 Kristen was a pioneer to the sport of kayak fishing in and around the Grand Isle area. 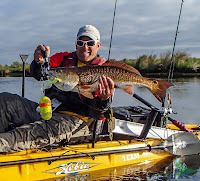 Kristen and her husband Danny operated Calmwater Charters and were known to many as the founders and operators of the famed Ride the Bull kayak fishing tournament. Kristen was instrumental in developing, growing, and educating many about the sport of kayak fishing in and around Grand Isle. While Kristen lost the battle with cancer her memory will continue to live on. At last year’s Ride the Bull tournament a kayak only launch was dedicated in the name of Kristen and Danny Wray, so the next time you venture down to Ludwig lane on Grand Isle to launch your yak in search of that catch of a lifetime, think about Kristen and all she’s done to aid in the welcoming of the yak community, because I know she will be looking down upon all of us in our little plastic boats. As the prayer ended and the horn blew, all you could see were little white lights moving in stealth throughout the marsh and down the main channels. 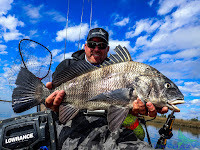 For the first time ever it seemed that the weather gods had shined down among the participants, the weather was perfect, cool, light winds, good tidal range, and perfect water conditions. I knew the results were going to be ground breaking. As I pedaled my Hobie back toward the launch, I could already see 50 plus people standing in line with weigh bags and ice chest. This was a scene I haven’t seen in at least 4 years in the tournament. Usually the winds are horrible, the water is low, and weight numbers for this event aren’t always good, and rarely ever great, but today was a new day, and based on the line, there were a lot of fish that were going to be hitting the scales. 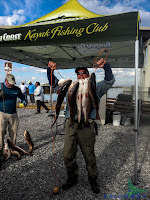 I talked with many anglers, some had beautiful reds and couldn’t find trout, some had limits of beautiful trout and couldn’t find reds, and then there was a handful of those that found the gold under the rainbow and were standing in line holding 5 fat red fish and 25 nice trout. Now keep in mind that’s 30 keeper fish and likely another 20 to 30 throw back fish that didn’t make the cut, all caught on only 6 lures, talk about some plastics that can hold up to a challenge. 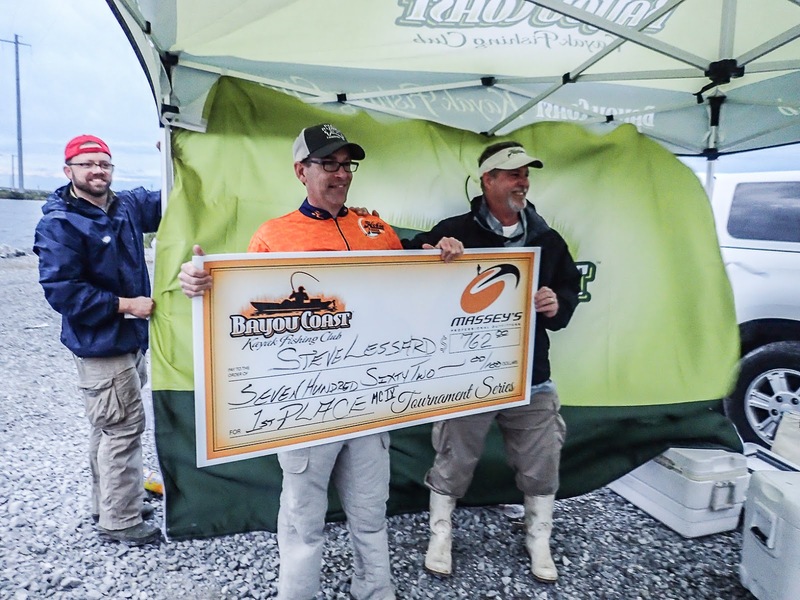 After hours of fish being weighed the results were finally in and only ounces separated the first and second place finish, and with a total 125 anglers and a total weight of over 1200 lbs. of fish, it’s easy to say that this is the most successful Minimalist Challenge to ever hit the books. 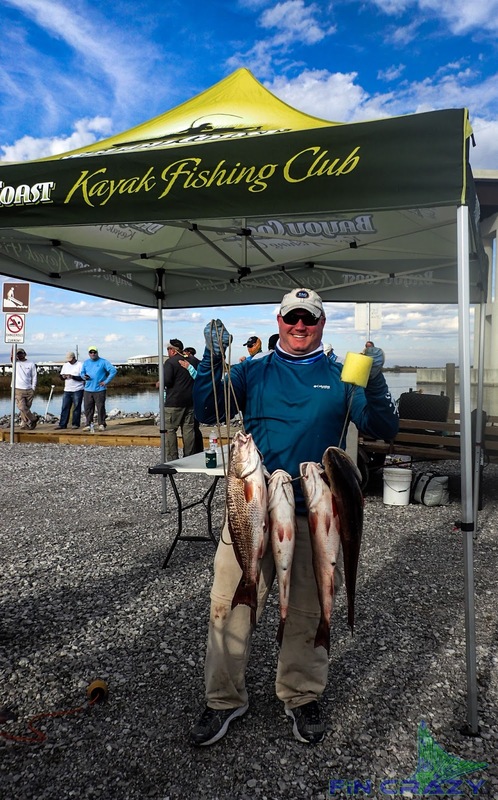 Both first and second place had weights broke the 42 lbs mark, and second place only had 4 reds, but he did have a pile of heavy trout. As tired as everyone was from a full day of fishing, I have to recognize the tournament director and weigh master, they both fished the event, they both caught fish, and they both worked tirelessly for nearly 3 hours at the scales measuring and weighing every fish that came in. Without commitment and volunteerism like those that run the Bayou Coast Club, there is no way these events would be possible. Thank you guys! 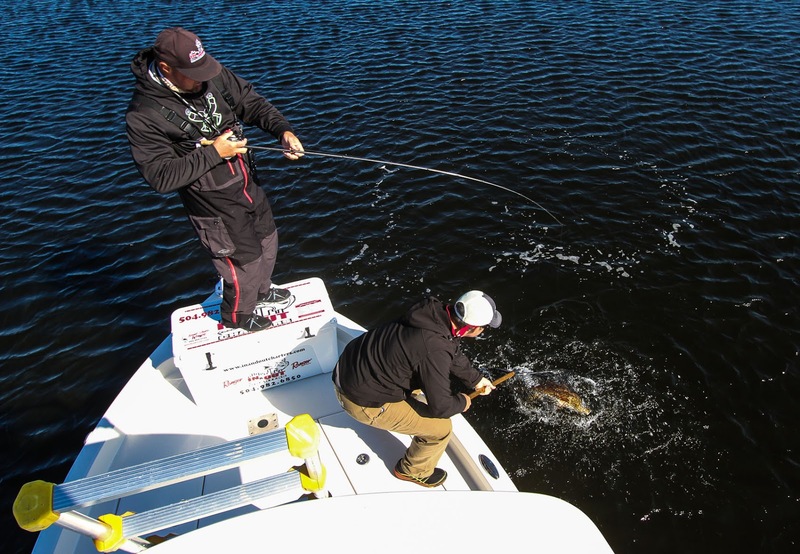 Ever sat in front of the TV and watched professional bass anglers go at it on the water, their attention to detail and the speed at which they make decisions is amazing. As they scan their depth finders and study the ground contours, water depths and temperatures, they quickly put together a game plan and go to work. 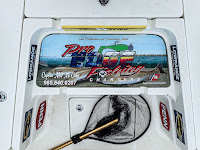 With a dozen rods neatly placed on the deck, endless amounts of tackle stacked and organized in compartments throughout the boat leaving them thousands of options to comb through every second, their minds are racing through a constant checklist of the next lure to try, the next stump to attack, color changes, weight changes, line changes, the options are endless. While some people watch these shows and fool themselves into thinking that they too would catch big fish if they were fishing exclusive bodies of water, another group of viewers think, man, if I could have one day on the water with a pro, I would ask questions about every cast, bait choice, target choice, and anything else they think might possibly give them an edge up on the fish and on surrounding anglers. Well this month I got to put all of those questions to rest when I had a ride along with a local professional. 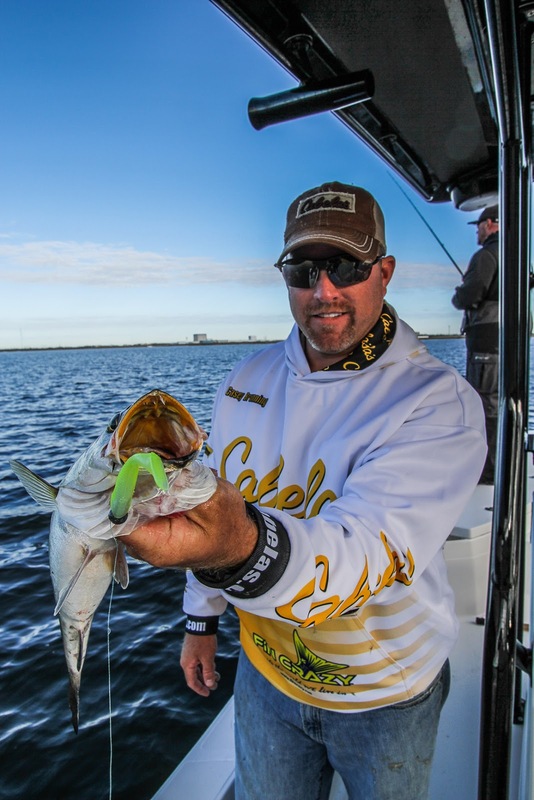 Captain Matt McCabe of Pro Edge Fishing is a local saltwater charter captain that specializes in chasing speckled trout throughout the Lake Pontchartrain and surrounding areas, but what a lot of people don’t know about Matt is that he spent 12 years on the pro bass fishing circuits competing in the Bass Master Southern and Central open divisions. 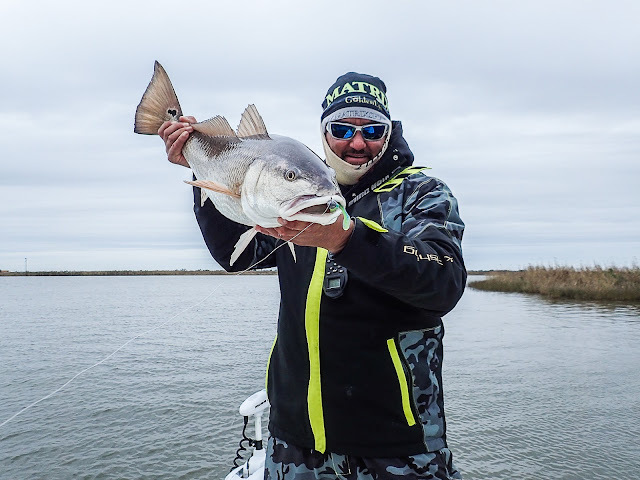 Matt’s knowledge of the saltwater was limited growing up as his focus was always on the prized largemouth bass, but since leaving the tour in 2009, Matt quickly turned his education to speckled trout and that turn has earned him a successful charter business. 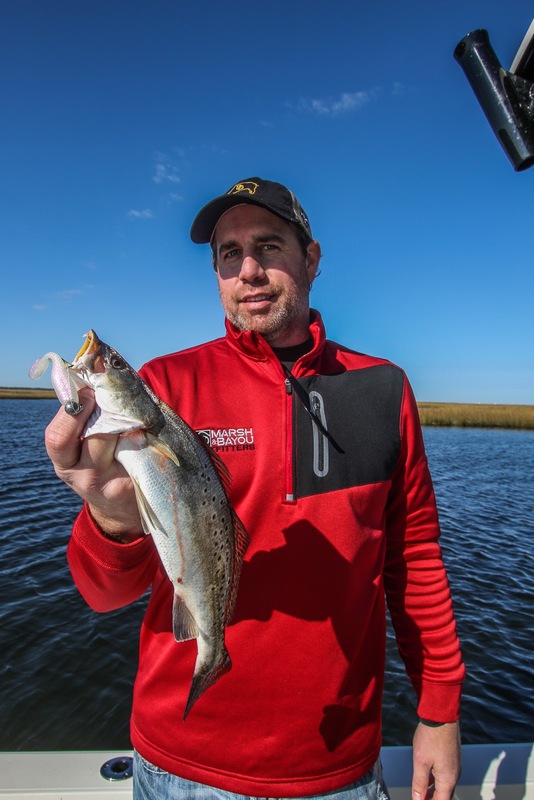 What Matt may have lacked in youthful trout knowledge was outweighed by his attention to detail and desire to be successful. Our trip started well before the sun even considered waking up, as we rolled out of Southshore Bait and Marina, the 300 Yamaha was purring and just waiting for the throttle to hammer down and push the 24 foot Skeeter on its way. 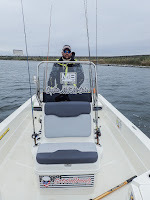 As a cold front had just rolled through and the temperatures plummeted nearly 20 degrees and the wind was blowing a solid 20 knots, I knew the day was going to be a tough one, but in the back of my mind, I knew I was with a captain that had endured these types of fronts in the past. Finally the hammer fell and we were off through the darkness and up the intercostal waterway to battle the elements and conquer Mother Nature. On a cold New Year’s Eve day, I originally thought we were going to fish the “great wall”, but as we passed under the famed “green Monster” I knew we were going into unchartered waters for me. 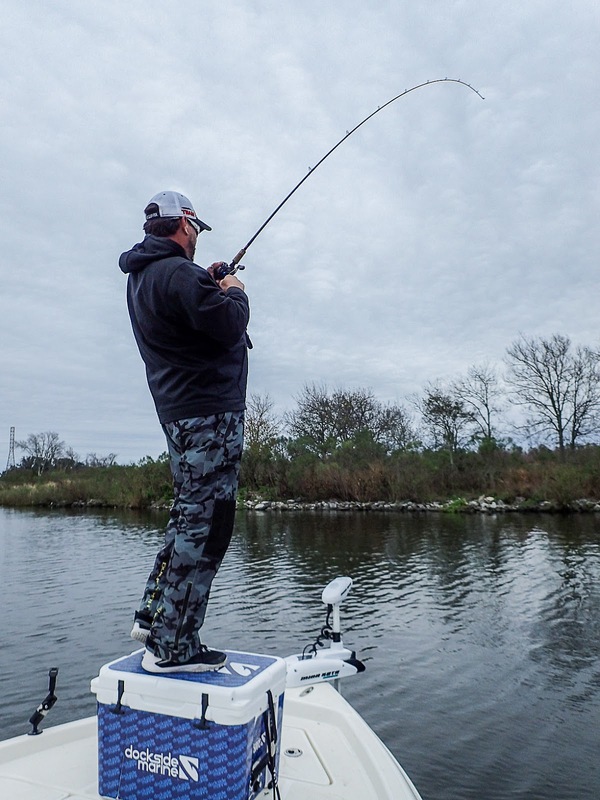 As Matt eased up on the horses and the Skeeter began to come off plane, he was constantly glued to his depth finder, not his GPS, but his sonar. He quickly pointed out we were in 40 feet of water and to watch the bottom as it was going to gradually come up. At the point of about 30 feet he shut down the engine, dropped the trolling motor and gave me a play by play of what the bottom contour was going to do. As he walked me through the play by play I was constantly glued to the screen, until he mentioned that we could start fishing. 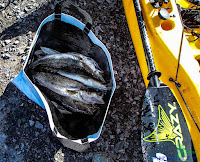 He followed that up with, “we can catch a few fish here, but where they really sit is about 150 yards up where a small cut out of the ledge is sitting.” I looked at the shoreline and the rocks nearby, but nothing to my eyes could explain a cut out in the ledge. Matt didn’t know exactly what created the missing section of the ledge, but he knew where it was and he knew there would be fish there. 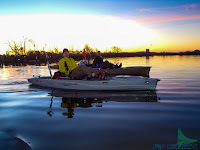 As we worked the drop off and the deeper flat above jigging Matrix shad on 3/8 and ½ oz jig heads boating a few fish here and there we approached the “spot”. Matt turned and said, “Watch this,” and with his next cast boated a nice trout that went between 3 & 4 lbs. He was right, he knew where they would be stacked up, and as we drifted over and around the area, it was clear as daylight on the sonar, it was one of those things you just wouldn’t come across if you’re not familiar with your electronics. 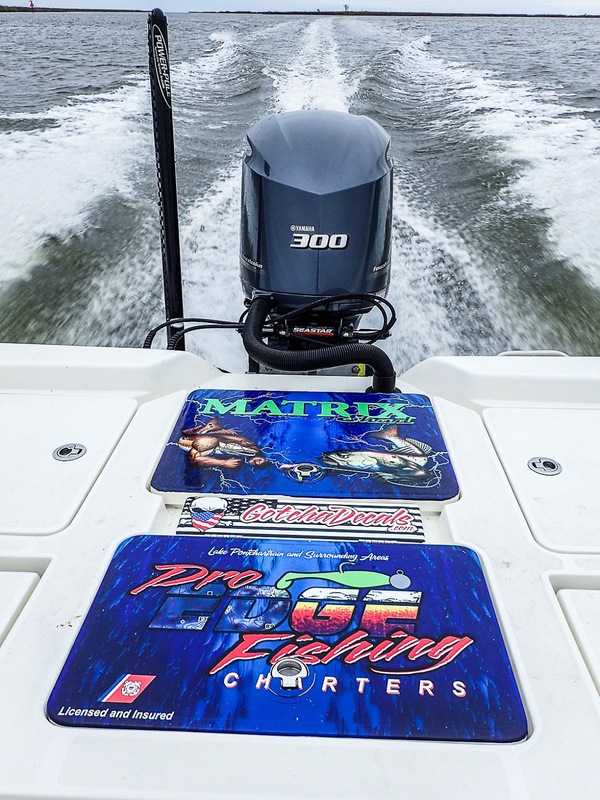 Electronics is one of Matt’s greatest assets; he is a big believer that in deep water and waters with any type of contour or cover underneath, that your electronics can help result in either filling the box or just covering the bottom of it. 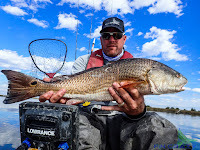 Matt uses a Lowrance touch screen model because their system is user friendly and their commands stay the same from one unit to the next, but taking his knowledge of sonar use from his bass fishing days over into the saltwater arena has really allowed him to learn things that a lot of other anglers just overlook. Matt can actually run his trolling motor until he finds the fish on his Lowrance, turn the boat around, choose a lure weight that falls to his specifics, and count it down until it’s sitting face to face with a speckled trout, and while some people that are not knowledgeable on sonar units may not believe this, I actually witnessed it. It can be done, and Matt can do it. Matt is a big believer in fluorocarbon line and if you need convincing he is happy to oblige. Matt landed 4 trout in the boat before I landed one. 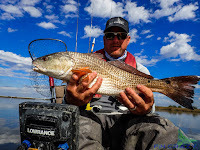 I knew he was a flouro guy and so am I, the only difference was he uses pure flouro and I use a flouro 7 foot leader mated to braid, well needless to say after being shown up for nearly an hour, I decided to start using one of his rods that was spooled with straight flouro. 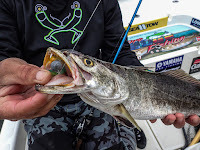 We actually did a little test prior to my hard headed transition and it turns out that my lure was falling several seconds behind his lure, we chalked that up to the buoyant properties of braid vs sinking flouro. These are the little subtleties that many don’t ever grab hold too, and that’s just one of the advantages to getting into the boat with not just a charter captain, but with one that’s spent a decade competing for a living; this guy knows the little things that make a huge difference. After a few spots and the temperatures and wind continuing to drop we decided to call it a day, after all it was New Year’s Eve and we both had plans. Given the conditions and the amount of fish in the box it was more than a good day, it was a great one. Captain Matt is a true professional in both knowledge and people skills, he does what he does to make others happy and he has a great time doing it. It’s not every day you find someone that loves his job, but when you’re with Matt; it’s obvious he’s one of the few. 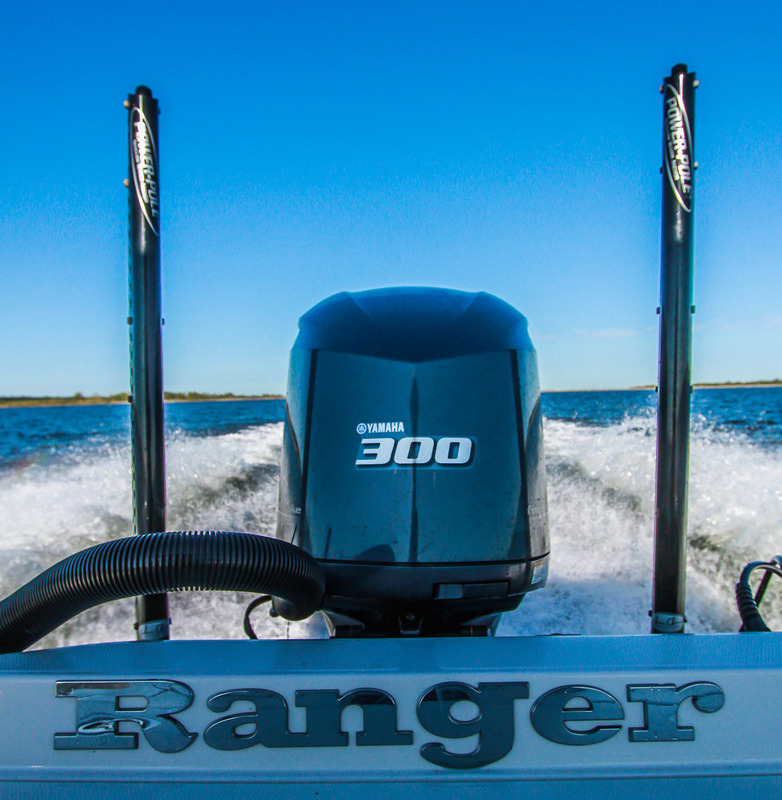 What’s your favorite way to fish? Drop shot, I learned it on Smith Mountain Lake in Georgia and it’s landed me more bass than I can count. 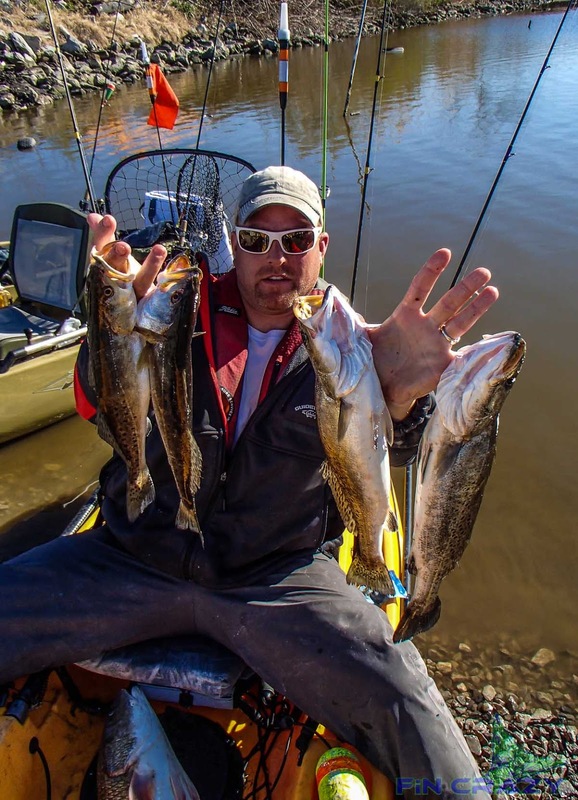 Bringing the drop shot into trout fishing has really allowed my clients an exciting way to fish without watching a cork. 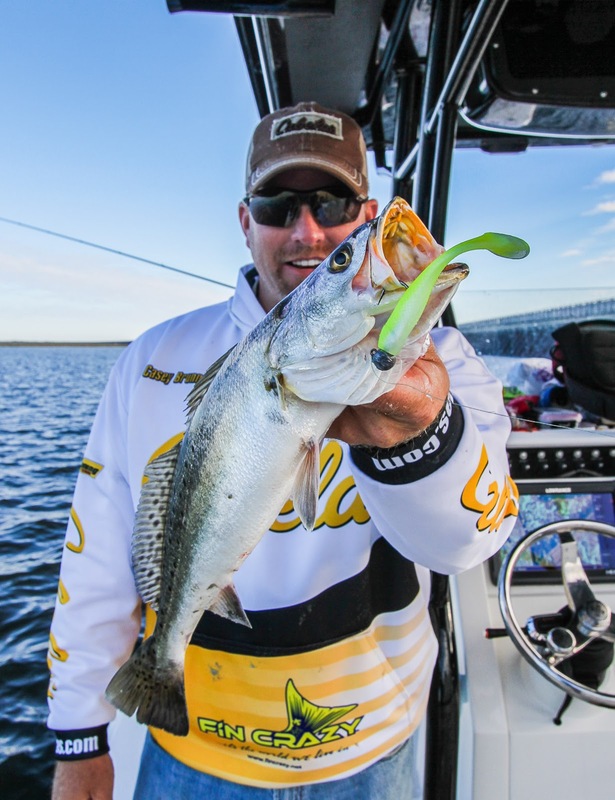 What was your biggest challenge transitioning from Bass Fishing for a living to Saltwater fishing for a living? 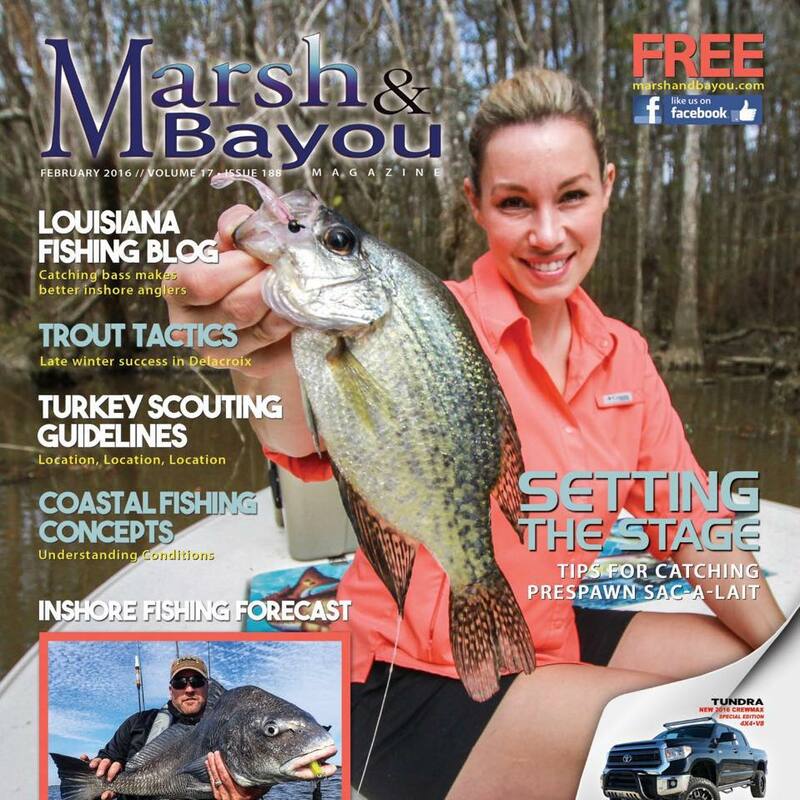 Who was your biggest influencer or mentor when you transitioned to trout fishing? 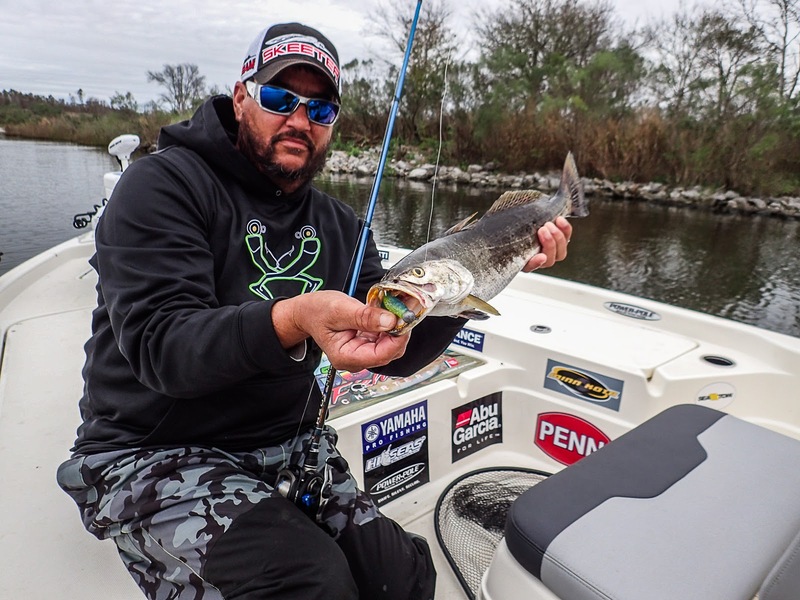 Chas Champagne was a big mentor for years, he was an educator and a friend that really helped me move forward learning speckled trout habits. Who is your mentor now? Mike Gallo of Angling Adventures of Louisiana, Mike has been a teacher, a coach, and a business professor. He has taught me all about the saltwater industry and the business side of it all. I am not sure I would have grown to where I am today without Mike in my corner. What’s the best part of being a Charter Captain? The kids, it’s all about the kids. Getting a kid on the boat and teaching him about more than just video games and seeing them smile holding up their fish is just a pure joy to me. I take part in a lot of charities and kid events because it’s the kids of today that are going to stand up for all of us tomorrow. Do you still have sponsors that carried over from your bass fishing days to your chartering? 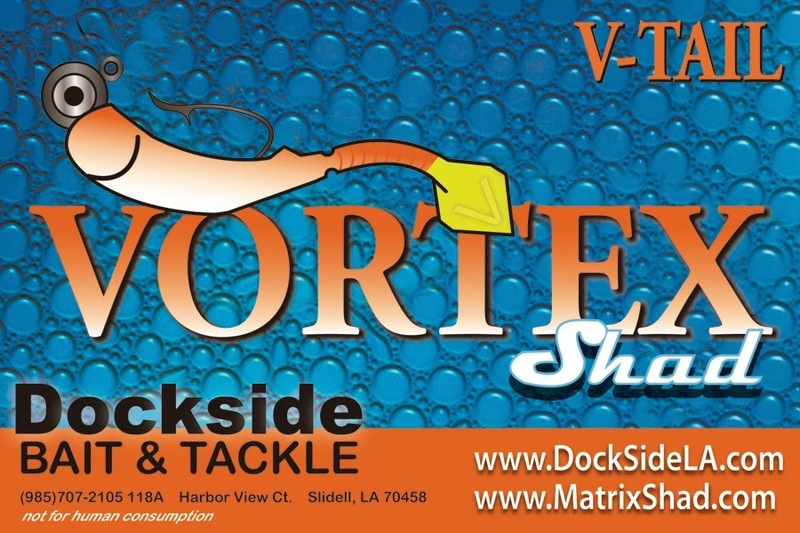 Well, Dockside marine is my greatest supporter, but I am also on the pro teams for Skeeter, Yamaha, and Seatow. 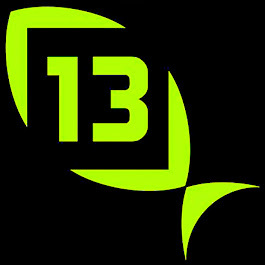 I support a lot of products like Matrix Shad and Boss Outdoors, I stick with companies whose products I believe in and actually use. 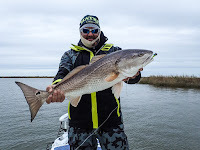 In the Final weeks of December, I had the opportunity to host good friend and great angler Craig Dye, of Last Cast Productions, down in Delacroix, la. As a kind gesture Craig went home and made a short clip of what the day was all about. 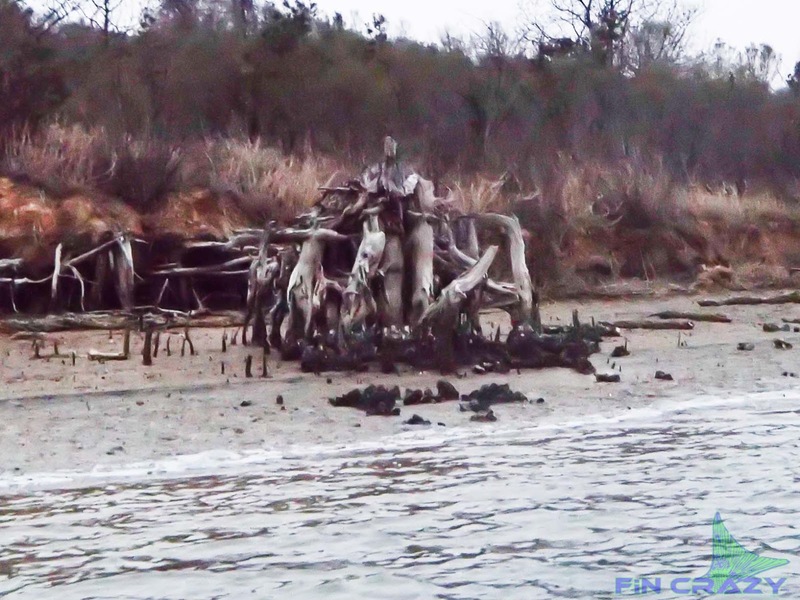 Conditions were in the lower 50s and a strong north wind was blowing along with a 1.2 foot falling tide. We caught everything on Matrix Shad and Rockport Rattler jig heads and Live shrimp. 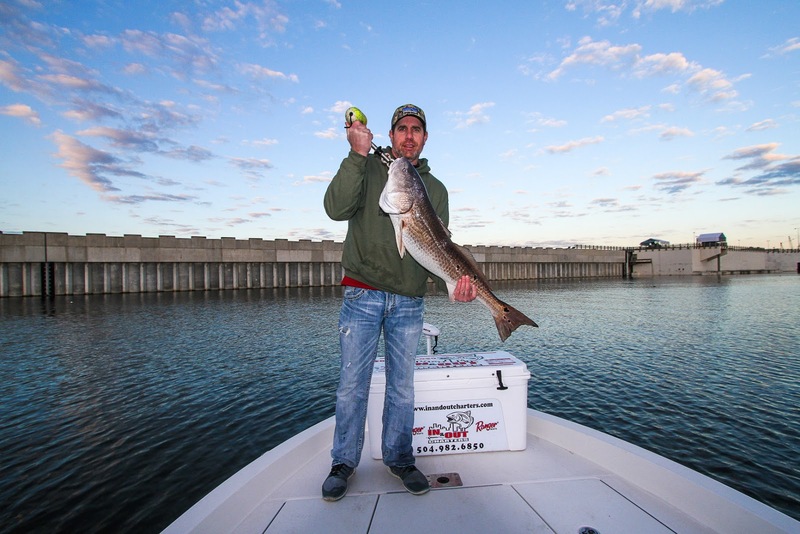 We didn't have to travel far from Sweetwater Marina to get into the action and we finished off a 50 speck limit before 9 am. From specks we moved on to some shaded sight fishing, but as you can see in the video, Craig was successful. 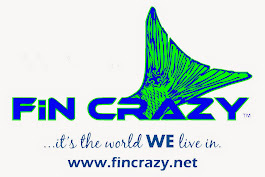 Just click the pic below to get started on a 2 minute clip of a lot of fish. Get ready for January and the Minimalist Challenge????? 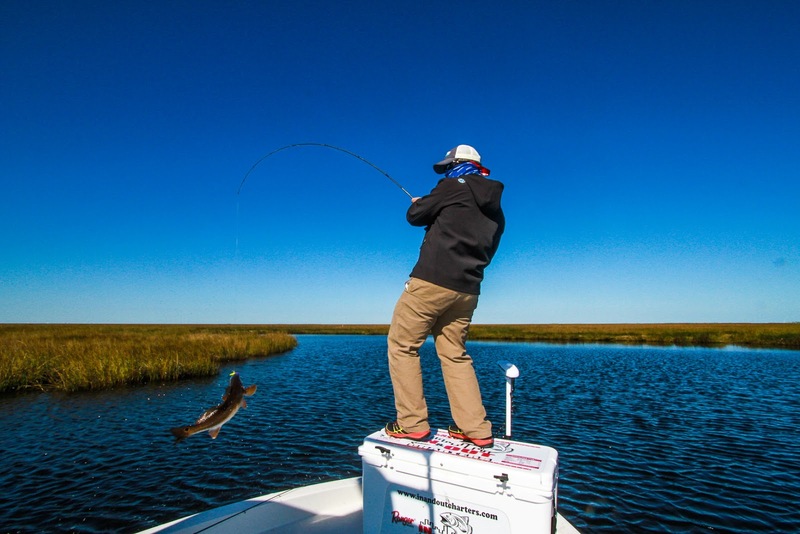 We have waited way too long for the waters around south Louisiana to reach the 50 degree mark, but it’s finally here. In the first week of January, over two nights, the water temps dropped from 66 to 51 degrees in some parts. 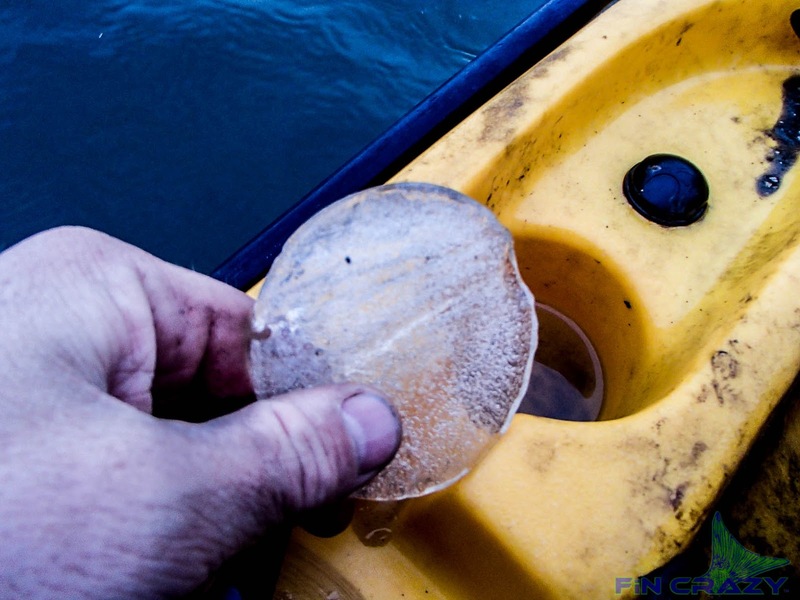 That drop is what many of us in the kayak community have been waiting for. 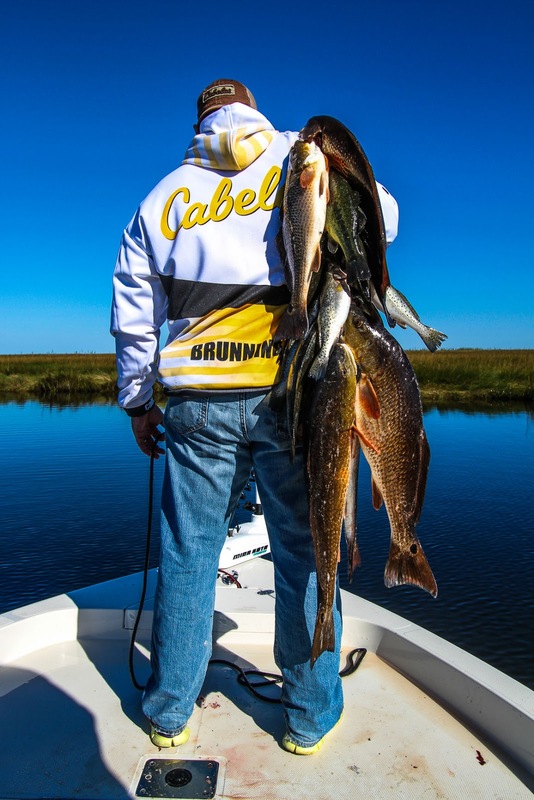 Days where you don’t have to leave an hour before the sun, where you can chase trout all day rather than redfish, and where you have to remind yourself to drink enough water, because you’re not sweating like you did on Christmas day. 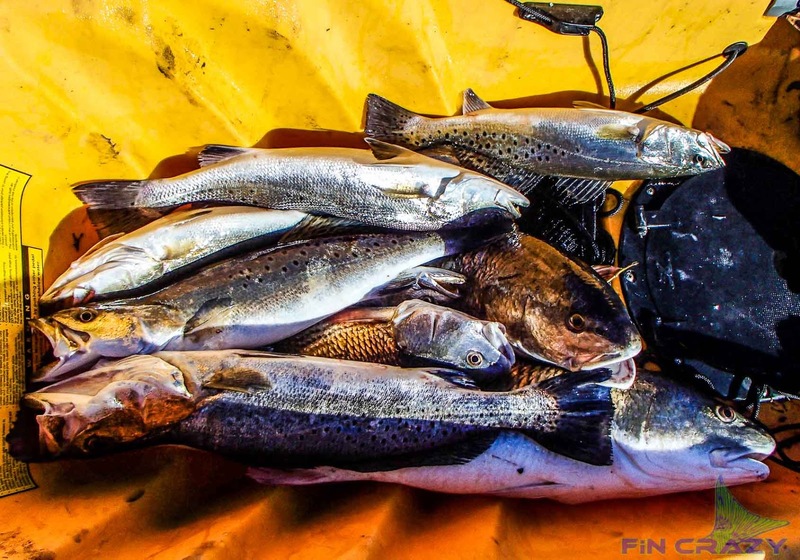 If you are chasing trout, now is the time. 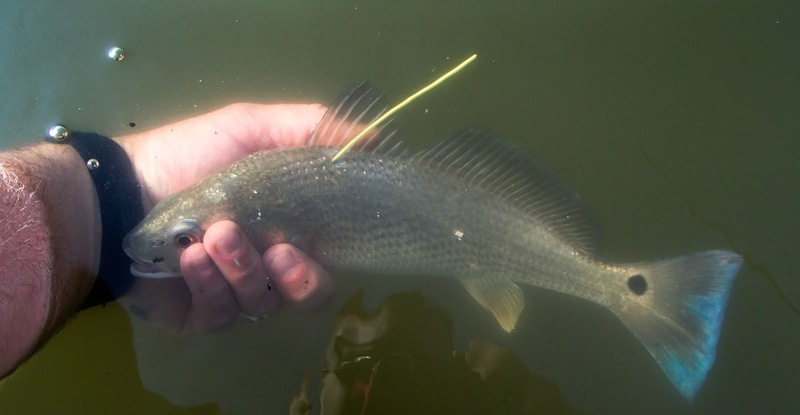 The trout transition into our interior marshes started over a month ago, but the congregation of trout has been minimal. 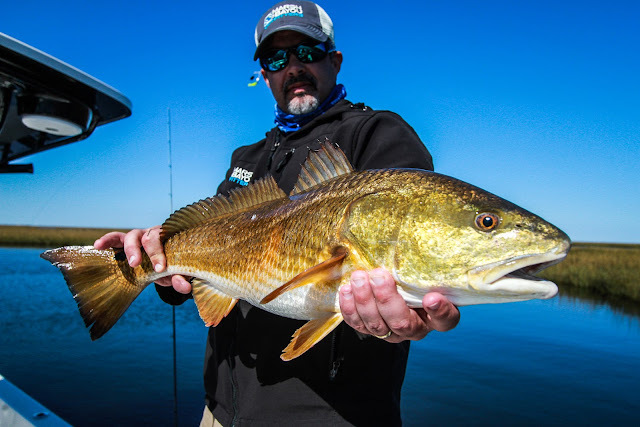 You could go out there and drift flats popping a cork, but the nonstop action has been minimal. Well, with the water temps now in the normal range for where they should be, there shouldn’t be any problem finding schooled up trout. 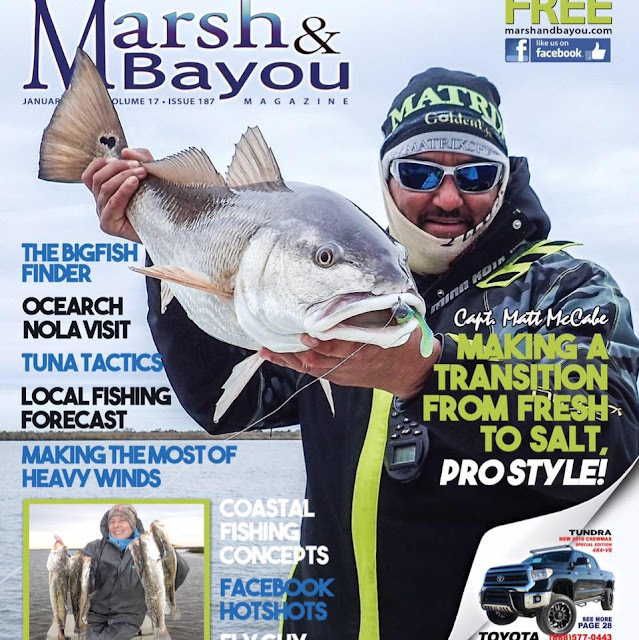 Whether you are jigging the draining marsh into Bayou Terre aux Boeufs or finding deep canals down in Leeville, the action should be hot. The easiest way to fill your bag this month is to find an area where the marsh is draining into a deeper canal; this is an easy location for stacked trout. 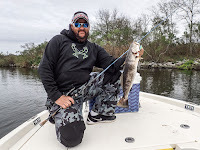 Another good saying I heard years ago that has held true when waters reach the low 50s is “when the water gets colder, fish over oysters.” I am not exactly sure where I heard that saying, but it holds true when the water temps drop. 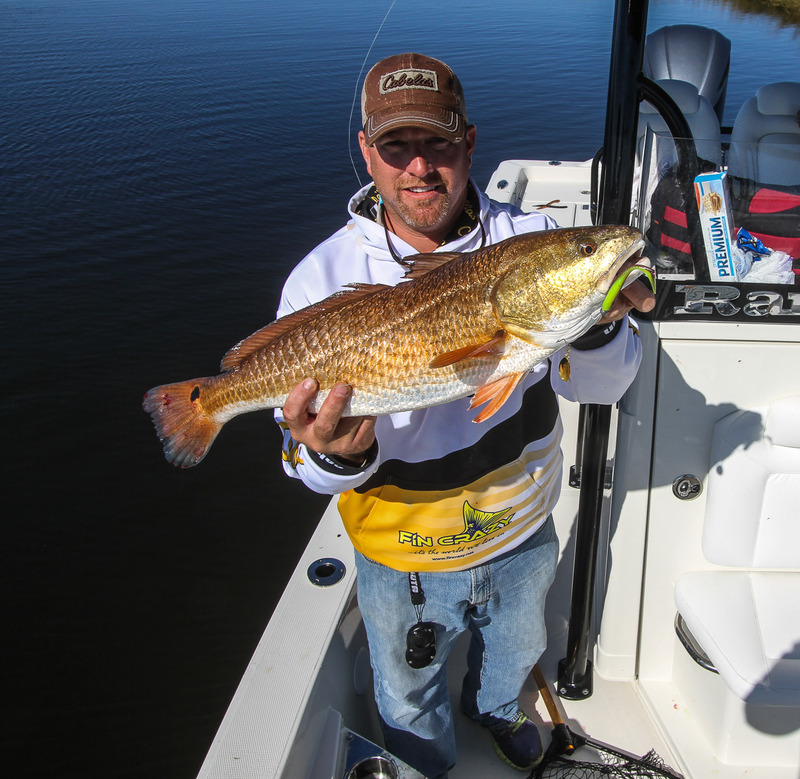 Get ready for low tides, cold weather, and some fun camaraderie. 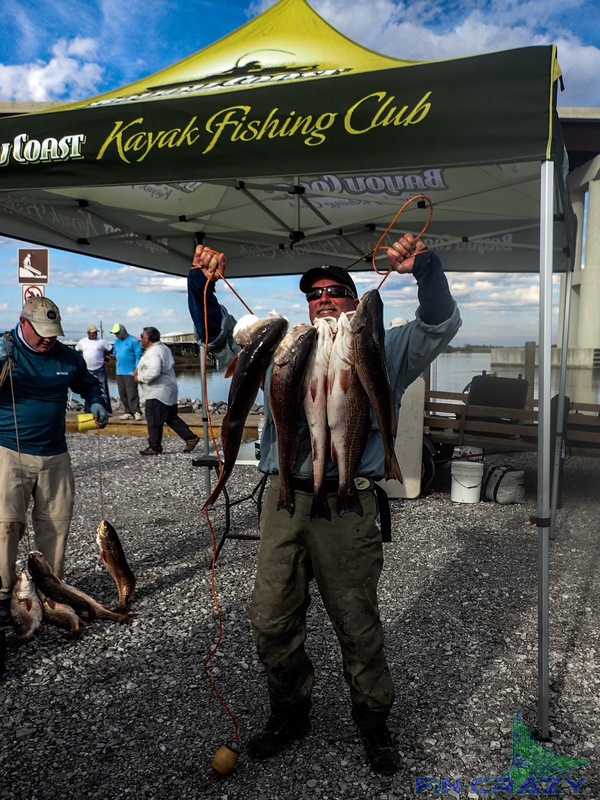 If you are fishing this month’s Minimalist Challenge down in Leeville, your best bet for pulling off a win is to fill your bag with a limit of reds and then chase your trout second. 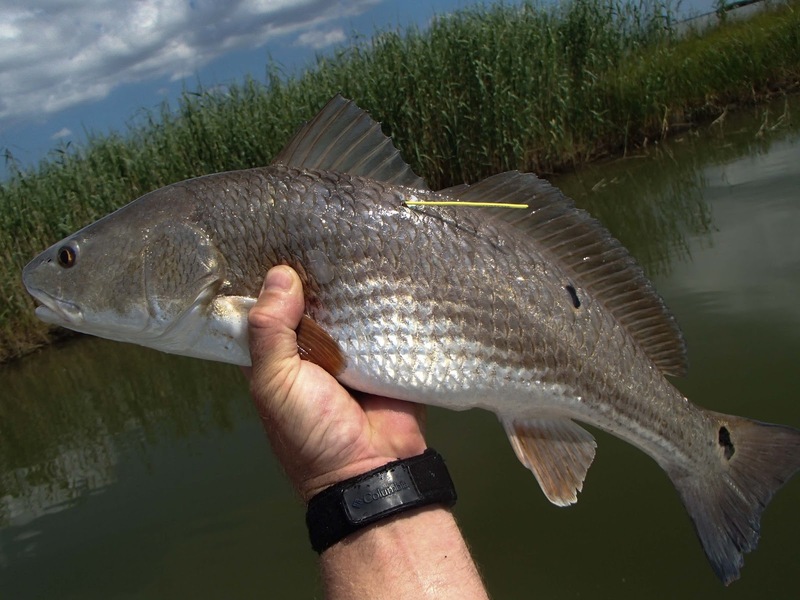 If you can find some clean water around Lake Jesse and some redfish on the way, then you are likely going to be in the running for some money. 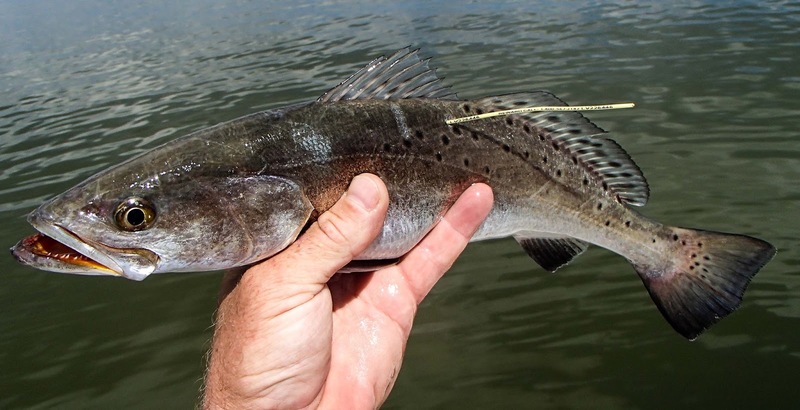 Lake Jesse has been producing some good numbers of speckled trout lately with jigs and plastics and corky style lures. 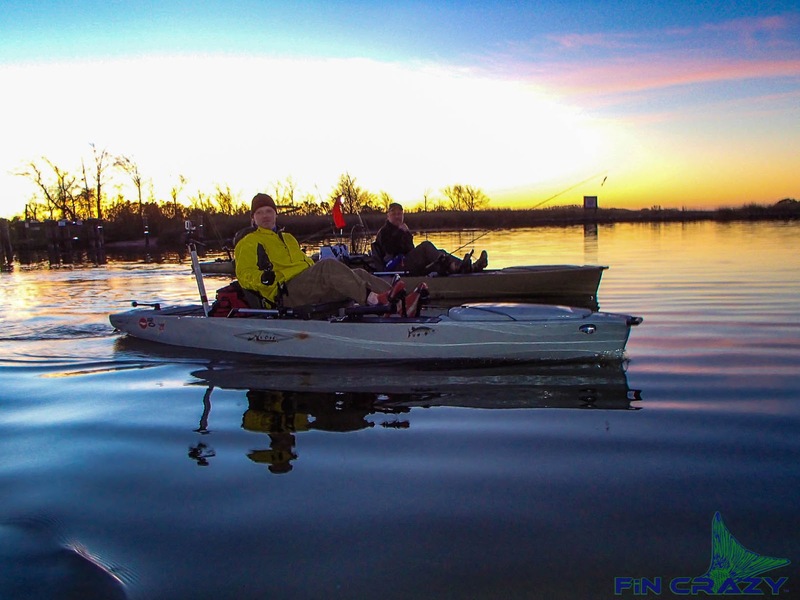 If you decide to go south for the tournament, don’t be scared of the graveyard area, it’s a deep area with lots of snags, but it holds some beautiful fish this time of year. From Paddle Palooza to last year’s Minimalist Challenge, there have been a lot of winning fish pulled from the vicinity and if you don’t know where it’s at, just look for the sunken barges and boats off the west side when driving across the Bridge to Fourchon. There are also some solid areas to fish north of Leeville on the West side that have some deep canals with flats on each side that are covered with oysters. 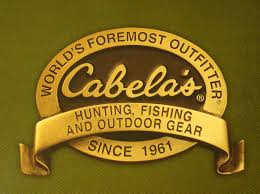 You will likely find some of the hometown favorites scouring this area on tournament day and pre-fishing. 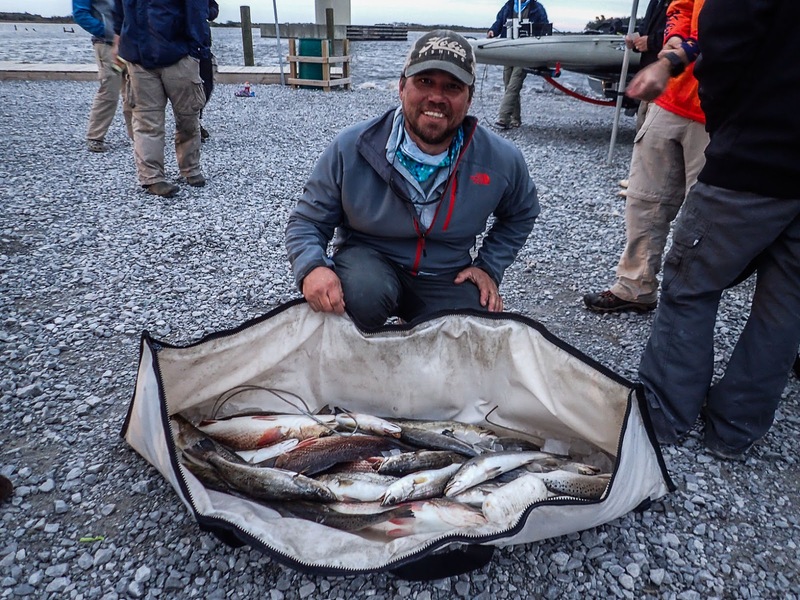 If you are staying local this month, Hopedale Lagoon is the place for steady trout action, that is if the water continues its colder temperatures. There are oysters spread out throughout the lagoon and a channel in the middle that you can follow by the crab trap bouyies. 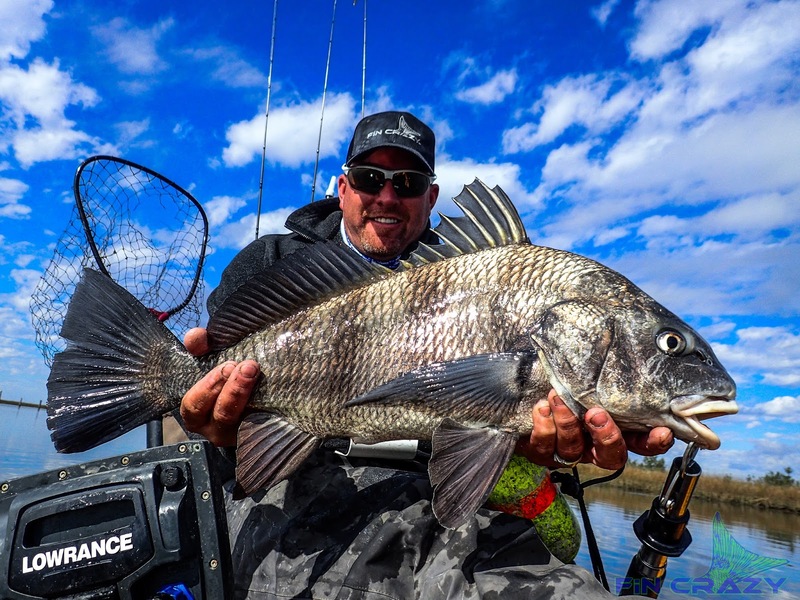 I am a big fan of jigging matrix shad and quarter ounce or 8th ounce jig heads in the “goon” but trolling works well too. You can also usually find a solid bag of reds along the eastern shoreline using spinner, spoons, or gulp under a cork. 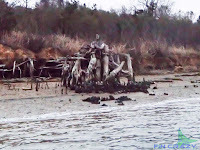 Shell Beach is also another hot location this time of year for the kayaking community. 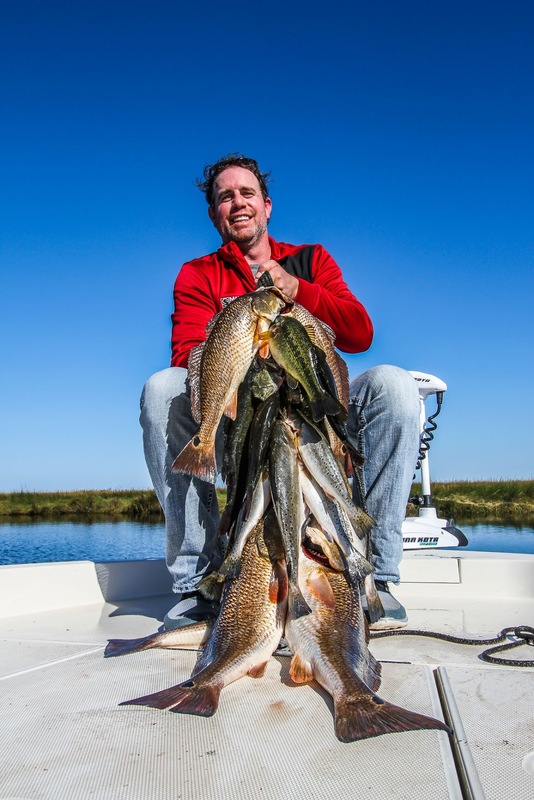 As duck season comes to an end there is a lot of marsh areas between the intracoastal and lake Borgne that hold a lot of red fish, but don’t forget to hit the mouths of the canals you use to enter the marsh as they sometimes can hold a pile of speckled trout. No matter where you go this month make sure to dress heavy, dress dry, and always have a spare set of clothes tucked under the deck in a dry bag. I know it can seem like a hassle, but if you happen to fall in, it will be the best thing you take with you. Being in 50 degree water with air temps in the 40s is not a recipe for a good time, it’s a recipe for disaster. 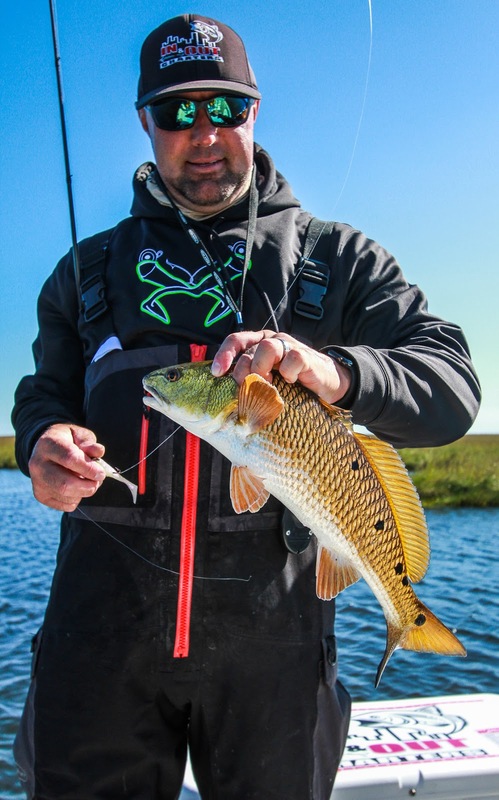 While fall fishing took a little longer than usual to kick in this year, the recent string of cold fronts have definitely had the trout on the move and their transition into our interior marshes is now in full force. 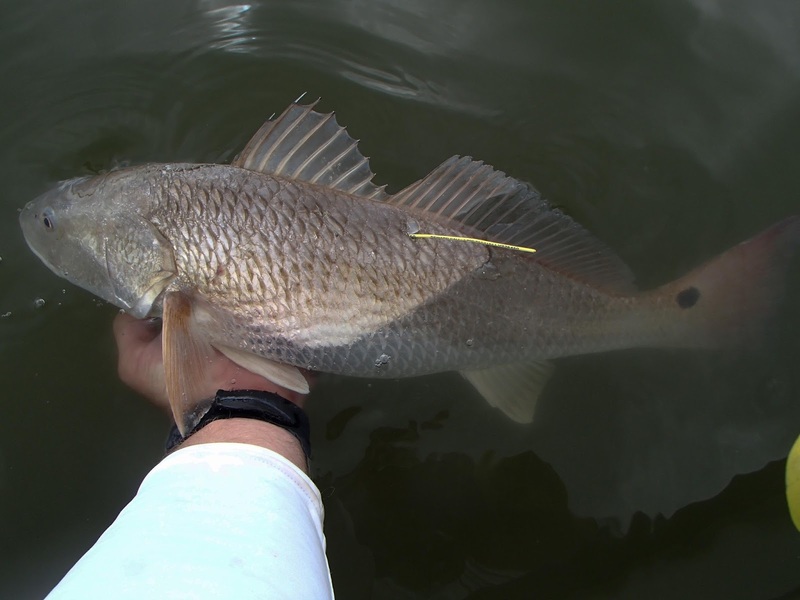 While they have been showing up in low numbers in their usual winter spots, the fall areas have been on fire throughout the gulf areas of the state, it seems every person I talk to is slinging limits of yellow mouths over the gunnels every day. This month I had the opportunity to get on the water with some local superstars, in their own minds of course, and pick their brains about different topics that they are passionate about. As I arrived at Rigolets Marina an hour before the sun was set to rise, I was met by Ranger Pro and local guide of In & Out Charters, Capt. Bubby Lamy, and General Manager, third generation owner of Double D Meat Co, Josh Stogner. These are two individuals that want nothing more than to succeed in everything they do, whether it’s putting fish over the rail for clients, or making sure that your family is getting the best country smoked sausage there is, these guys are not only good at what they do, but they are proud of it. Capt. Bubby is a native of south Louisiana, a family man, a father of three, an inspiration to many, and a captain that strives to make sure you’re smiling the entire day on the water. 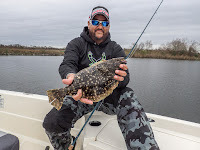 With over 30 years of experience fishing the waters of Louisiana mixed with a personality so entertaining it’s contagious, you can’t help but have a good time. Josh is also a native a south Louisiana, a family man, a father of two, and a provider to many of us throughout the country when it comes to the best smoked sausage around. With more years of experience in the processing industry than he wants to admit, being the third generation of the family owned Double D Meat Co., Josh has worked long and hard to perfect their meats and grow their business into a national sensation to taste buds, all while carrying on the family traditions and values that his previous generations started nearly 50 years ago. With the sky still black and the wind beginning to blow, Capt. Bubby pointed the bow of his Ranger Bay 2510 south and let loose on the 300 Yamaha horses and we were on our way. The throttle stayed steady until we made it to our first destination, “the wall”. As we arrived at the large locks, it was a sunrise of great proportions, the sun was shining on the tugs pushing the barges along the ICW, the tips of the Paris Rd Bridge or “green monster” were shining, and for a minute it seemed that everything stood still. But just as I was attempting to take a few pictures I was reminded by the comical captain that it’s now fishing time. 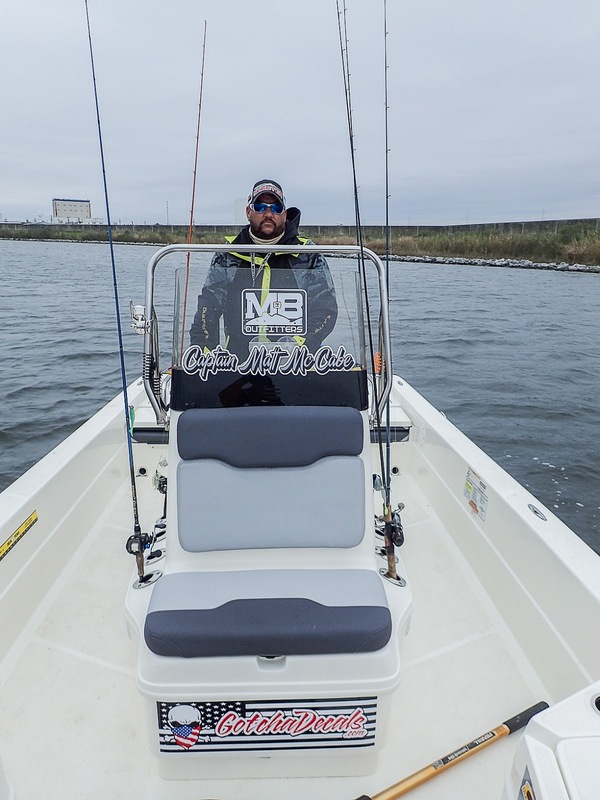 We made our way to the back corner section south of the gates and nosed our way slowly closer to the wall, Bubby and I were jigging Matrix shad in Lemon Head and Limbo Slice, while Josh was Carolina rigging live shrimp. Within minutes Josh was hooked up and it didn’t take us long to figure out it wasn’t a trout as the drag was screaming off the reel. Josh hooked into a gorgeous redfish that did everything he could in his attempt to elude the net, he made runs around several crab pot buoys, of which we had to unwrap by hand while Josh continued to fight the beast, and after what seemed like 10 minutes, we finally had the first fish in the boat. During this time a couple other boats had pulled up and started working the back corner of the area. As we high fived and took a few pictures, we were quick to get back to the task at hand. Within minutes there were trout flying into the boat from every direction. After 10 or 15 yellow mouths in the box, Capt Bubby decided to make a move, his sights weren’t set on just catching trout, he wanted to catch big trout, and so with that in mind, we cranked up and moved to another section of the wall about a mile or two away. That’s all it took, you could see the excitement on Bubby’s face, he was like a kid on Christmas morning, and I just knew what lied ahead for Josh was going to be an experience he would never forget. As we arrived in the middle of nowhere, all you could see was crystal clear water and marsh grass for miles. Bubby and Josh got in the front of the boat and I climbed up the T top and was perched like a bald eagle searching for his next meal. Bubby knew these waters well and was able to almost point out the fish before we could even see them. 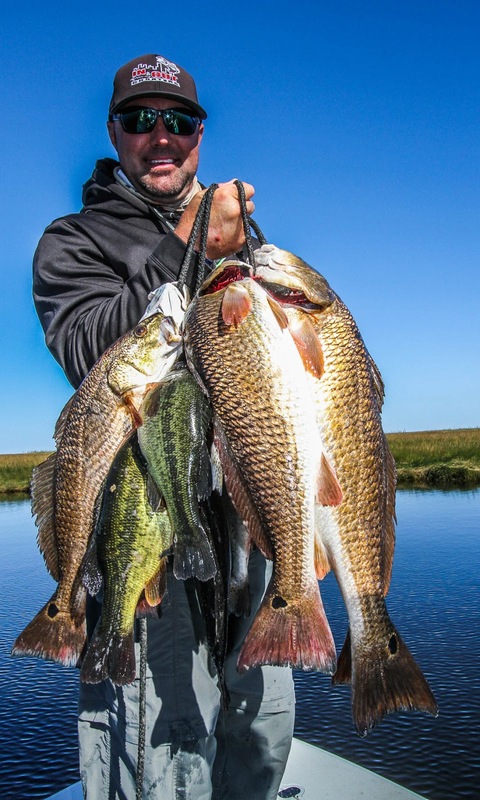 With matrix shad hooked up to spinner blades, the flash and thump was too much for these reds to resist. First it was one red here and one red there, and then it was schools of reds cornered in the back of ponds. Once Josh got his bearings and understood what to look for and where in the column the reds were swimming, it didn’t take him long to get in on the action landing his first sight fished redfish. Within a couple of hours there were three limits of quality redfish on ice and I’m pretty sure some of the stories throughout the day will be recalled and shared for years to come. Double D has been serving our community for 48 years strong and has always had a family atmosphere over the last 30 plus years I’ve been going there. They can ship to anywhere in the U.S. by request and can be found at all of your local and major food chains. 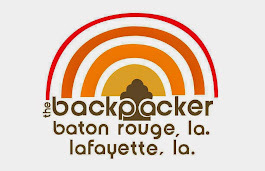 As for their processing operations of wild game, I don’t drop my deer of anywhere except DD in Bogalusa, and now when you drop off your venison you can even enter your deer by weight into their big buck competition to win a wide array of high end prizes. Adventure Fishing World Championship, part 1 of 4, "The Beginning"